**'''Texturing''': [http://en.wikipedia.org/wiki/Texture_atlas Texture atlas], [http://en.wikipedia.org/wiki/Projective_texture_mapping projective texture mapping (PTM)], [http://www.xj3d.org/extensions/render_texture.html RenderedTexture node] for multipass rendering - 2D texture version of GeneratedCubeMapTexture, first proposed by Xj3D and also implemented in X3DOM and InstantReality, useful for all kinds of NPR, shadows, mirrors, etc. **'''Texturing''': [http://en.wikipedia.org/wiki/Texture_atlas Texture atlas], [http://en.wikipedia.org/wiki/Projective_texture_mapping projective texture mapping (PTM)], [http://www.xj3d.org/extensions/render_texture.html RenderedTexture node] for multipass rendering - 2D texture version of GeneratedCubeMapTexture, first proposed by Xj3D and also implemented in X3DOM and InstantReality, useful for all kinds of NPR, shadows, mirrors, etc. Also review 8-bit vs 24-bit texture application differences - see https://castle-engine.sourceforge.io/x3d_multi_texturing.php#section_default_texture_mode. **'''Chroma key''' for TextureProperties node to support special transparent background. *'''Audio and video''': alignment with [https://www.w3.org/2011/audio W3C Audio Working Group], especially for [https://webaudio.github.io/web-audio-api Web Audio API] and [https://webaudio.github.io/web-midi-api Web Midi API]. Adding royalty-free formats, streamability, [http://web3d.org/pipermail/x3d-public_web3d.org/2013-December/002681.html disabling attenuation], 3D aural spatialization using reflection from simple geometry (such as [http://gamma.cs.unc.edu/Sound/RESound RESOUND]). 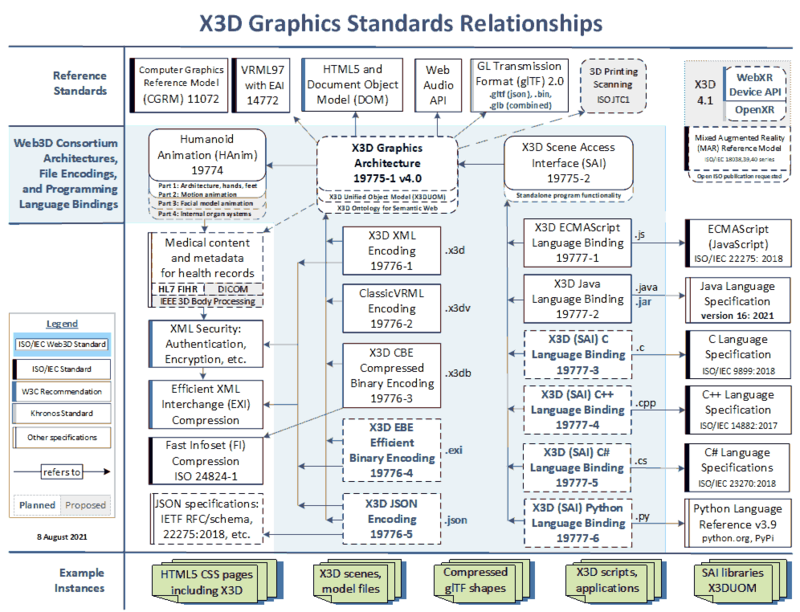 EXR: EXR file layout, developed as OpenEXR by Industrial light and magic (ILM). QR codes: Consider QR codes as a first-class image type since it contains imagery and information, especially useful in Mixed Augmented Reality (MAR) applications. HDR: Improvements in both materials and rendering for high definition rendering technological advances.